Not sure why, but I suddenly felt the strong urge to see if I could still program in 6510. So I implemented a backtracking solver that finds the path in a maze from the '-' symbol to the '+' symbol (actually an undergraduate programming exercise I did long time ago on a Motorola 68000). The result running on a Commodore 64 emulator is shown below. The active search path appears as white '*' symbols, dead end positions appear as '.' symbols. And below the solution has been found. You can find the assembler source file maze.s (and a 6510 cross-assembler) on my Commodore 64 page if you are interested. You can define a different maze in the .byte section (just make sure the active search path length cannot exhaust the small stack of the Commodore 64). Also don't forget to remove the artificial delay to appreciate how fast machine code runs! Yes, that's right. I too became interested in computer science because of the Commodore 64. Although I still have my Commodore 64 somewhere, nowadays it is much easier to relive the good old times with an emulator, such as CCS64 (Per Håkan Sundell), VICE (the VICE team), or MP64 (an emulator under development by Michael Plet). A while back I wrote a 6510 cross-assembler win2c64 that converts an assembler source file into a target file that can run on one of these emulators or, with some work, on the real Commodore 64 (an assembler converts human readable mnemonics, labels, and simple expressions into machine code; win2c64 is a cross-assembler because it runs on a Windows platform but generates machine code for the Commodore 64). If you are interested, you can find the cross-assembler and some sample programs at Aart's C64 page. Now that I am enthusiastic about textures, I also added a board texture to the other games. 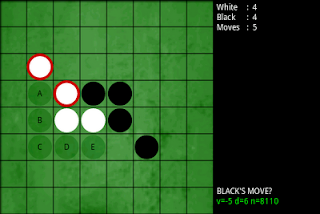 For Reversi for Android this hopefully also addresses complaints that the board was "too green". For Checkers for Android, I simply reused the coffee table texture, as shown below. 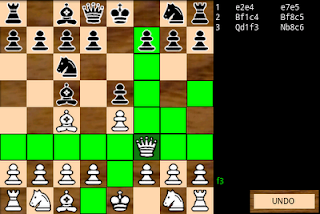 A user "dragonfish" suggested to add texture to the wooden chess board in Chess for Android. So I took a picture of my coffee table and used that as texture for the dark squares. See the result below. Together with a minor engine improvement, this new feature has been released in v2.2. 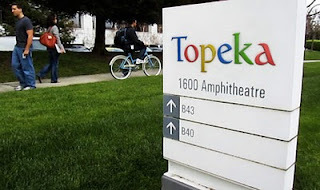 I am now working for Topeka.